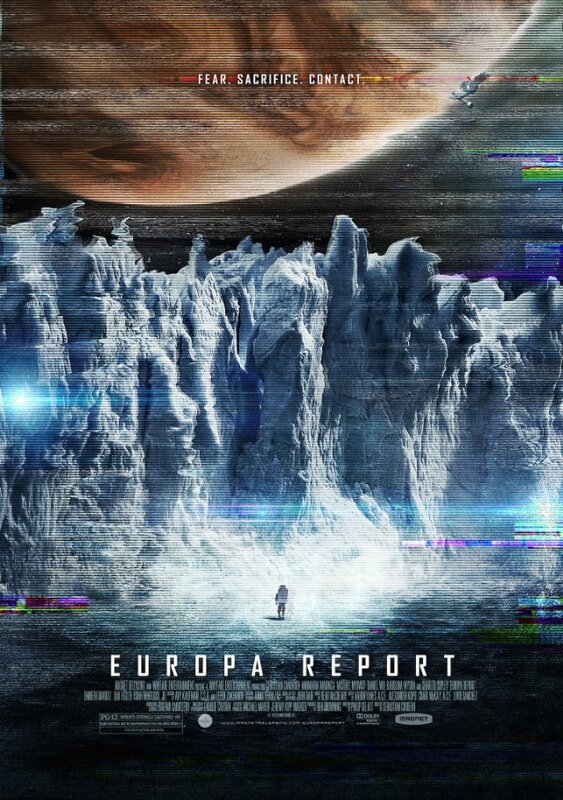 As opposed to the 1990 European film about a Jewish boy hiding his lineage while posing as a Nazi, Europa Report is a taut found-footage/sci-fi/thriller feature directed by Ecuadorian Sebastian Cordero with a theatrical release date in August, but can be caught on iTunes if you wanna sneak peek. I’m just going to say right out of the gate that I’ve never been a found-footage fan. Not even with the Blair Witch Project. It’s frequently confusing. Its used as a substitute for talent. But usually its boring. The conceit that we’ve suddenly found film/video/harddrive/whatever and we’ve cut it together to bring you what happened wears off in the first few minutes, and you are no longer invested in the characters or care what happens to them. Character development through both writing and performance can bring to you empathize, and therefore be moved by the movie. Rarely — if ever, do found-footage franchises hit that mark. One exception to this is Grizzly Man, which IS a legitimate found-footage film, which was put together by Werner Herzog, and not by some kid with a DSLR and iMovie (BTW, that’s hyperbole for comic effect, and in no way do I think that Paranormal Activity 4 was edited on iMovie). With the bad taste in my mouth from Apollo18, lets get back to the topic at hand: Europa Report. In a nutshell, we have detected the possibility of life on Europa, one of Jupiter’s moons that until now we thought was a big ball of ice. On closer examination, we’ve detected thermal dynamics going on – changes in the surface, and furthermore, geyser-like jetisons of…liquid water. Now, this isn’t just a plot point of the movie. This is real science stuff going on. So, with the possibility of finding life elsewhere in our solar system, a privately funded space program recruits the best of the best to take a trip out to Europa to see what’s up. And, like most “found-footage” films, it isn’t a spoiler to say that things will not end well for the crew. Otherwise it would be a “footage” film. The first thing that stands out for me is its attention to detail and at least an attempt to get things right – scientifically. This is a major leap in filmmaking where pseudo-science runs amok and big words are thrown in willy-nilly to sound smart. The filmmakers behind Europa Report sat down with both NASA and SpaceX to find out the specifications and technology required for the nearly two year mission to check out the Jovian moon of Europa. How would they staff the ship? What kind of problems would there be along the way? Where would they land? Why would they land there? What would they do when they get there? Everything seems to fit into place and make sense. And it appears that they got the scientific seal of approval by the presence of Neil DeGrasse Tyson saying (almost presciently) that he’d like to drill through the ice, stick a camera down there, and have life lick the lens. This attention to detail grounds the story and allows the audience to begin to immerse themselves in the situation. The second thing is that the performances feel solid. Outside of Embeth Davidtz as the spokesperson for the private company funding the mission, the rest of the cast are not “stars” in the celebrity sense. They have some notches on their belt, but they are not readily recognizable, so once again, we have a chance to relate to the characters, and not celebrities acting like characters. They are professionals with only the mission as the goal, but when things start to go awry, they let their humanity through just enough to let us in. And despite different personalities, there is not one character who would place their life in front of anothers’. The third are the visuals, which are a cut above the standard found-footage fare. With a slew of New York visual effects companies ranging from large (Method Studios), to medium (Look Effects), to small (Phosphene, Perception), Europa benefits from the talented individuals who were able to create the stark environment on Europa’s icy surface and the deep space exteriors in Jovian space. All of the work is never heavy handed, which works well to sell the verisimilitude. The story is told at a slow, methodical pace, and out of order. I’m not sure if this approach contributes to the tension or not. If would be an interesting exercise to see how it plays in the right order. I assume this editorial decision was made so that we would hit dramatic beats at typical Hollywood markers. However, due to the snail’s pace, I don’t think it was necessary. I like growing with characters and getting to know them before bad things happen. At that point, I CARE. I WANT these people to survive. I am rooting for them to survive. And this stems from spending the last hour trapped inside of a spaceship with them. Its a great choice by the director, and going a more exciting route to bring in the kids would have taken a smart sci-fi- film and pushed it into Armageddon or Event Horizon territory — which is a place where no one should have to go. During the slow trip out, problems start to happen when a solar storm knocks out their transmission. And it is here where, step by step, the horrors of space travel reveal itself. And its not about space life (yet) – and even that is restrained to things off camera, or under the ice, or mere glimpses. Everything about space travel is dangerous. Going outside to fix a broken panel? Potentially lethal. Radiation from the sun? Radiation from Jupiter. Magnetism from Jupiter. Landing on ice on a foreign moon. Taking off. Shifting ice plates. Lack of sleep. Nearly everything that goes wrong is either human error, or simply the dangers of being somewhere other than under the safety of Earth’s magnetic field and atmosphere. As much as I enjoyed going on this ride, I’m still not convinced that found-footage is the way to go. When you lock cameras down like Europa Report does, you remove one of the dramatic tools in your toolbox. The camera conveys a great deal of emotion and provides emotional cues to the audience. When you remove that, you end up crippling yourself to a degree. Editorial helps somewhat to balance that out, and for the most part, it works. The score also provides a gravitas to the story without being overwhelming or drawing attention to itself. But man, I think the story could have been more effectively told if the camera could have contributed. Overall, a decent low to mid-budget sci-fi flick which gets the sci right. Probably pretty slow for most summer audiences, but it’ll resonate with fans of 2001: A Space Odyssey or Moon. And if you’re a fan of Apollo18, then perhaps you should watch some good films. AFI100 is a good list to start with.